At breakfast Poala and Bruno gave us their address and contact details back home in Italy (we’d given our card earlier). It’d certainly be worthwhile catching up with them as they aren’t that far from our rellies in the north either. Travel is great! Janaka dropped us at Dambulla’s street-side bus stop and we didn’t have to wait long to get on an overcrowded, old clunker bound for Anuradhapura. 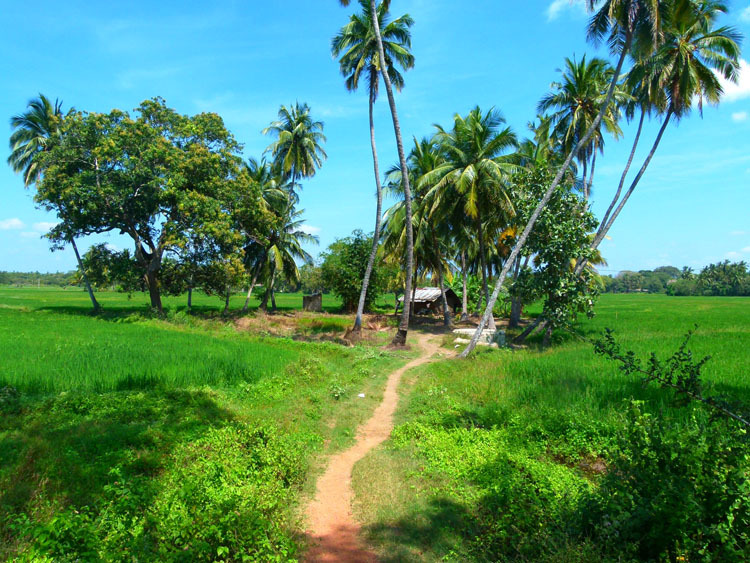 The countryside is now totally flat and laid out with palm-fringed rice paddies. It’s a nice view through the dirty bus window! Everything was going swell, until about 7kms outside Anuradhapura when the bus blew up its gearbox. Off came the driveshaft and out spilt a large number of metal shards onto the road. The bus came to an abrupt stop in the middle of the road, angrily spewing out grey smoke over the driver. Not the least bit phased, everybody just stood up and got off the bus and wandered over to the side of the road for the next one. Sure enough, in less than 5 minutes, another one turned up. It was full but that didn’t bother anyone, least of all the bus boy who got to squeeze everyone on (including us with our bags) and make some more money! Now there were 2 busloads of people crammed into 1 bus as it rocketed down the last few kilometres to town. Like a whale regurgitating krill, we all spewed out onto the sidewalk as if nothing had happened. Just your average day out here in Sri Lanka! It was really hot when we arrived, but fortunately, we only had a short walk to our hotel, the Sacred City Resort in the main street, much to the dismay of several tuk-tuk drivers! We used the afternoon to catch up on some work in the common area and to arrange some bicycles for tomorrow. At dinner we met a couple from Treviso in Italy (Luka and Luciana), it’s just near to our rellies place in the north (just above Venice). Talk about a small world! The next morning after breakfast, we claimed out “straight out of China” specials. The two very cheap, brightly coloured, step-thru, single gear bicycles, resplendent with plastic baskets on the front, looked suspiciously inadequate for either of our weights to ride around on all day. But we adjusted the seats and set off anyway. Mine was called “Princess”!! It was the first time we’d lathered on the sunscreen for a while, but we’d definitely need it. We pushed out onto the busy road and cycled about 3 or 4kms up to the Museum where we needed to buy our tickets (3875Rps ea). Shazz was quickly scolded for trying to take a picture, although there we no signs to this avail that we could see (unless they were written in Sinhalese/Tamil). I’m not sure why you can’t take photos, there didn’t seem to be anything that special or delicate. 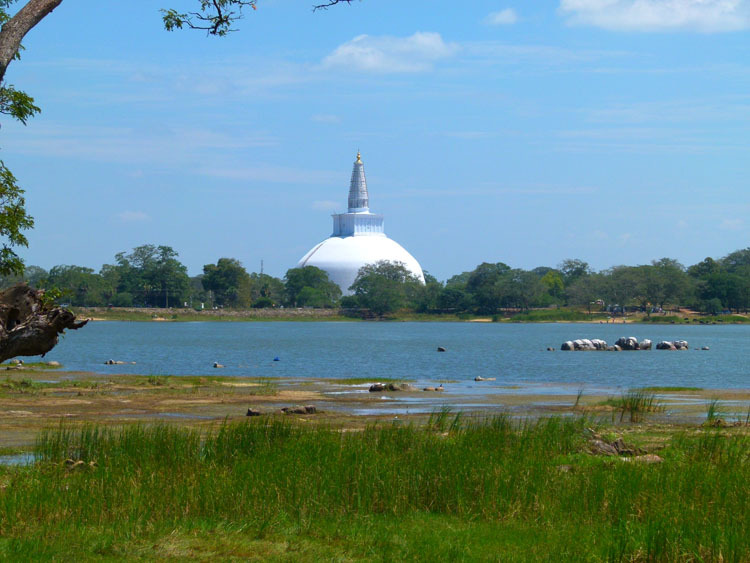 Anuradhapura’s ancient city is spread over a wide area that would take 3 or 4 days to see on foot, it’s even larger than the new town where we were staying. 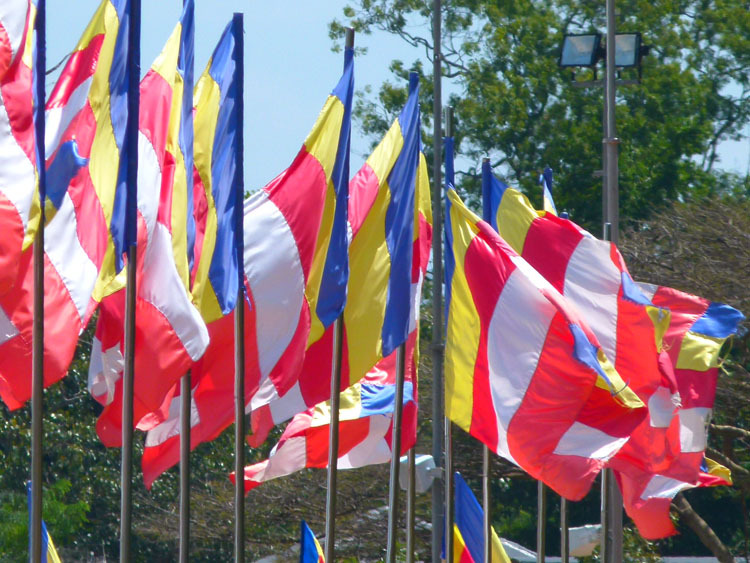 The old Kingdom was the capital and centre of Buddhist civilisation here in Sri Lanka. It was declared a World Heritage Site by UNESCO in 1982. The restoration of the old city is ongoing. Kalum, the owner of our Guesthouse, had given us a numbered map, in the order of how we should see things. It was the only way you could possibly navigate the hundreds of scattered ruins and giant dagobas (huge, dome-shaped Buddhist Stupas) without getting totally disorientated. The largest of the dagobas is the Jethawanaramaya at 122m tall. 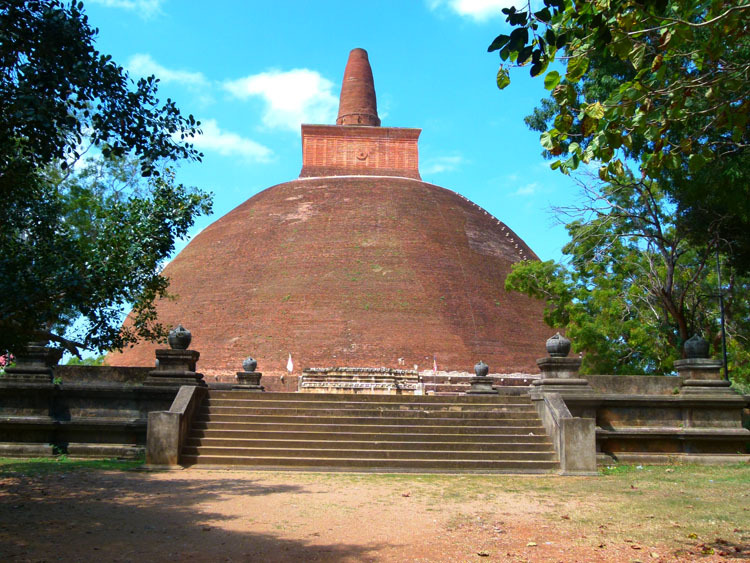 It was the tallest dagoba in the ancient world and is said to contain a sash that belonged to the Buddha. Buddha relics are highly revered by pilgrims, of which there were plenty about today. As useful as Kalum’s map is, it’s still a good idea to navigate with a GPS as it’s so easy to get turned around. In amongst the ruins, people have built their own houses and come and go as they please. No entry fees required. By about 2pm, we were hot and bothered and had seen the north half of the old city. 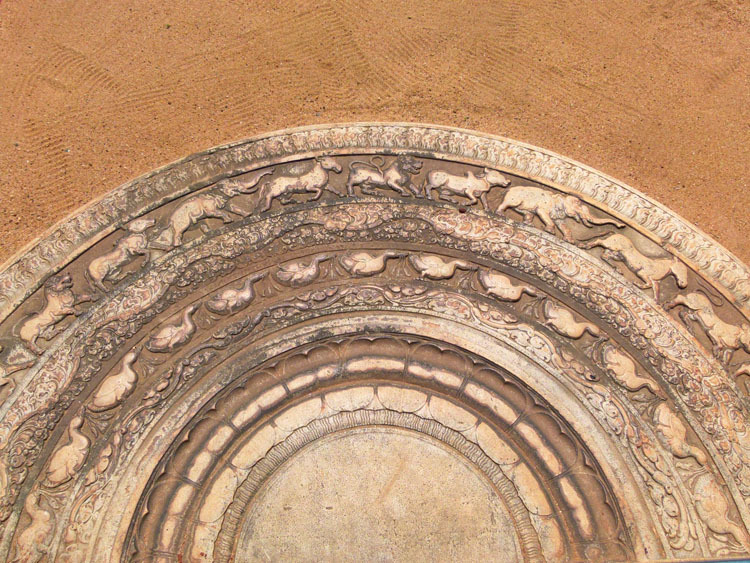 We started there because it contains nearly all the important sites; the Elephant Pool, the Guard Stone, the Moonstone and many of the larger stupas. So, having had enough, we stopped for a cold drink then pedalled back into town. As it was a Sunday, there was almost nowhere to eat that was open. So, after we visited an ATM and cashed up, we hit Pizza Hut for a late lunch. The air-conditioning was worth the price! The site is enormous and confusing, hire a bike (and a guide if you can afford it). Take a hat and sunscreen (water is available at most sites). If you’re not sure you can see it all, start by doing the North half first. It contains nearly all of the important sites. 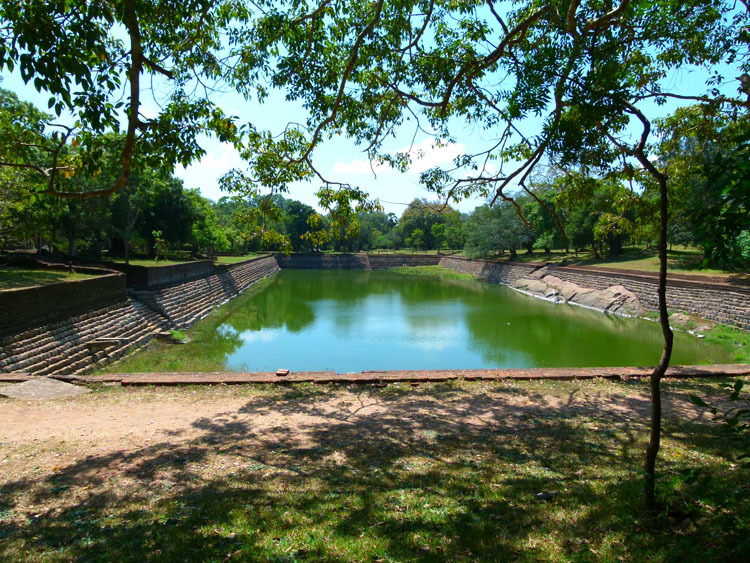 Previous story Dambulla/Sigiriya – For those about to Rock!